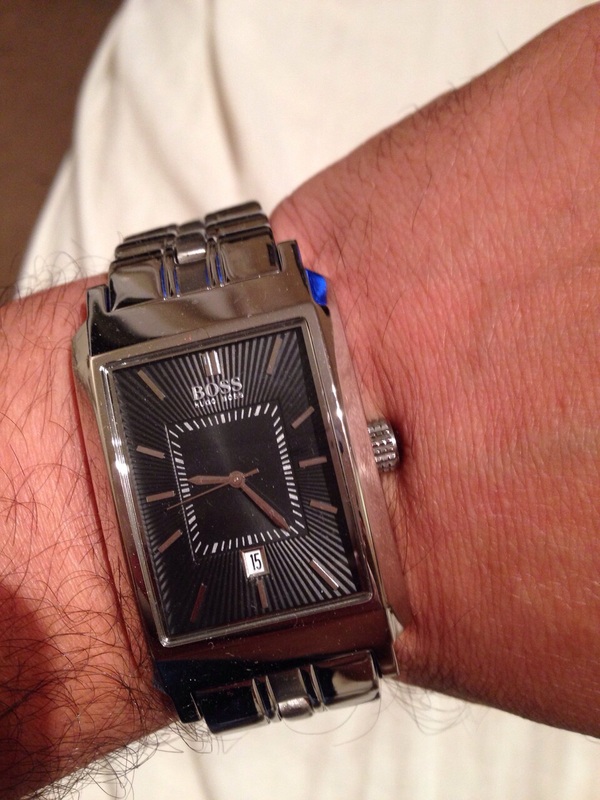 This mens Hugo Boss watch is made from stainless steel and has a black rectangular dial. The sleek dial features silver hour markers, silver hands and a date function. The watch fastens with a stainless steel bracelet and is powered by a quality quartz movement. The model comes with a Hugo Boss presentation box. I bought this for myself as I was in need of a new watch. The watch itself looks elegant and sophisticated, and is perfect for day and evening wear. Whilst it is quite lightweight, you can still feel the quality. The dial is easy to read and the black face compliments the silver of the bracelet perfectly. The Hugo Boss imprint, both on the catch and the dial, just adds to the look of this. I would definitely recommend this to anyone, either as a self purchase, or as a gift, as I was pleasantly impressed with this watch. The product is stunning. A classic yet stylish statement piece for a true gent of any age. The black face detailing completes the metal watch & stands out well. Really happy with the service I recived and really happy with my purchase. I was given the watch as my birthday present. Very pleased with the watch and so was my husband! Fantastic service too - i didnt receive it the next day but i didnt expect to as it was a bank holiday but i did get it the day after! Fantastic looking watch. Amazing look and feel to the watch, Lovely detail on the face and the catch. Comes in a stylish presentation box perfect as a gift or a treat for yourself. The bracelet is very comfortable and lightweight on the wrist. The clock face is black with a clear face so it is easy to read, the face is a good size to be able to see easily with out it looking chunky. Easy to read the date which is located at the bottom of the dial. The product is easy to change both the date and time and it maintains good time. 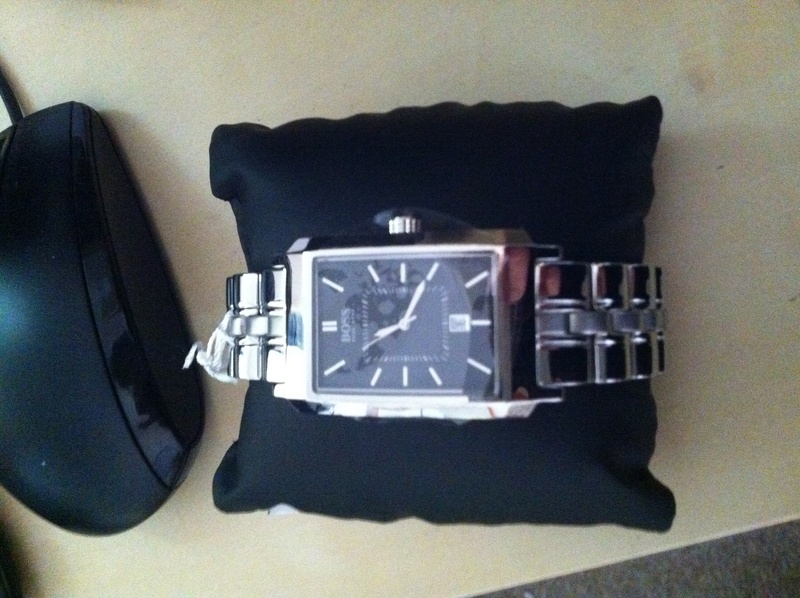 This watch is just what my boyfriend wanted and I got it for a great price, delivery was prompt, so all happy here. The watch is exactly as per the picture and description. I purchased it as a gift so he can wear it everyday to work. Very smart and looks nice on the wrist. I bought this watch for my husband for christmas,i am very pleased with the watch,and the style is great,the watch looks lovely on my husbands wrist,beautiful black dial,great watch for a great price. It is a good watch as far as I can see, style is exactly as it looked on the site. Only think is is that the metal is a little loud, but then again I havent had a metal strap before so that just may come with the territory. Such a lovely watch and know that my husband will love it. He doesnt like big watches so this slimmer style is perfect. Got it at a great price and able to get it resized it at the same time was so convenient. Cant wait for my husband to open it on his birthday. Lovely watch, bought as present for my boyfriend, looks nice and classy and is a nice size..not too slim but not too chunky, really pleased with it. Great service and quick delivery , item great quality , and lovely and light with a great face. Watch is gorgeous just what I was looking for. I hope my husband will be thrilled with the Hugo boss watch at Christmas. I wanted a dressy watch and this one matched perfectly. The black dial is so classy. I am very pleased with my purchase, not only was it a fantastic price, but also looks great on. Absolutely brill service. My boyfriend loves it and the price was to good not to buy it. Lovely watch, silver bracelet,black rectangular face looks great. Shame I cant review the service! Beautiful watch, the face of the watch has a subtle pattern which is different from most watches. This was a present for my brother and he loves it! I will attempt to provide a comprehensive review of this item, principally because it is truly a magnificent piece with many exceptional features. Moreover, as a designer watch collector who has tried and tested many watches in the high street, I would be delighted to share my views generally in order to guide your decision, should you wish to also own one. I will begin my review discussing the designer brand itself and how it has employed some of its creative genius into devising a piece which is truly unique in so many different ways. I will explain some of the features and detail incorporated into this watch, as well as how it may differentiate from similar looking watches made by other leading designer brands. I will further highlight some of the minor drawbacks or shortcomings I have observed and, indeed, I will consider ways in which it could potentially be improved. The watch is designed by Hugo Boss, a prestige designer brand with boutiques all across the UK, Europe and US, and who is normally compared with the likes of Armani, Guess, Gucci, DKNY, D&G etc. The watch is predominantly for gents, as it should be apparent. At first glance, the style of the watch may seem akin to watches designed by other brands like Emporio Armani and, indeed, it may cause a bit of an uphill struggle in terms of choosing and narrowing it down to the right watch however, this watch is different both in respect of its style and the material used. 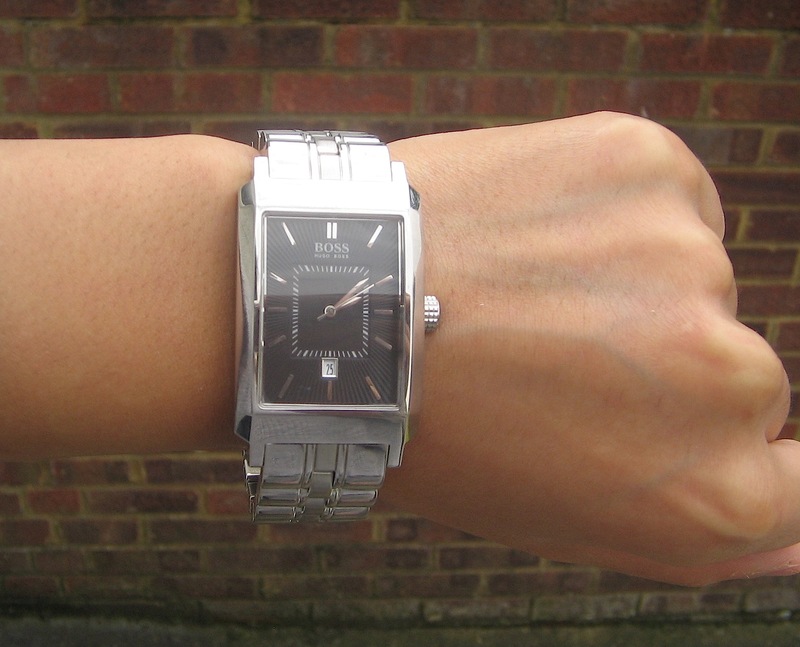 It does not use the common numerical or roman numbers instead, it uses dashes to represent its numbers, and the style of these dashes are unique because they are in luxury silver with a hint of sparkle, thus affording an eye-catching look and allowing for attraction to be gathered every time you move your wrist when near others. The dial generally is worthy of further mention. I concede that the colour may be ‘black’ according to the manufacturer’s description and when it is worn generally, but under strong lighting conditions, it appears to be a dark grey dial – which of course is compelling nevertheless, as it still affords the same level of appeal and richness when worn with a sharp black, dark or light grey suit. I, moreover, like the fact that there is a date function, and that it does not mar or interfere with the overall appeal of the dial I say this because I usually find that the date function on watches can hinder the attraction of the dial if it takes up too much space. Before I attempt to delve into the other impressive features and characteristics, it is noteworthy that the rectangular cap/cover above that protects the dial is made using ‘mineral crystal glass’, which in essence means that it is a hardened glass which is treated to be more resistant to scratches. This means you can wear the watch daily and with confidence. Indeed, if you are a person who does not like wearing objects which are susceptible to wear and tear or scratches very quickly, then a watch with a cap/cover made from mineral crystal glass is highly recommended. Of course, this is not to say that caps/covers made from other materials do attract wear or tear on the contrary, all cap/covers can attract wear and tear or scratches irrespective of the material. I am merely stating, however, that a cap/cover made from mineral crystal glass helps ‘reduce the possibility’ of wear and tear or scratches. It may be appropriate at this juncture to consider the other features and characteristics of this watch. In respect of the case itself, it is made out of stainless steel and measures at approximately 28-29mm in width and 5-6mm in depth, which is slightly disappointing in my view as a medium size case would have been desirable. However, this is not a major issue, and it is merely something that could had been considered or improved upon. In any case, if both the width and depth seem appropriate to you, then I suppose my slight criticism here should not matter since it is, I accept, down to preference at the end of the day. In respect of the bracelet – which for me is perhaps the most impressive and decorative part of this watch – it is designed with the use of stainless steel finish. The design of the bracelet itself is truly unique, because the distinct detail across the middle of the bracelet which offers that additional bit of attractiveness is something I have seldom seen in watches with stainless steel bracelets. In fact, a stainless steel bracelet (or even a sterling silver bracelet) will not generally offer much detail because the focus is meant to be on the colour of the dial, the features in the dial and the size of the case. However, it is clear that this watch takes account of the dial, the case and also the bracelet, which means you can certainly wear this watch with the expectation that somebody at least once will notice it and be captivated by it. Incidentally, I mentioned in the foregoing that both the case and bracelet is made using a stainless steel finish. Generally, this offers, of course, the appeal and richness that you inevitably require, but it is notable that this is a type of material which has wonderful durability in the sense that the possibility of it ever corroding or rusting is very minuscule. Though, having said that, it should be borne in mind that if the watch somehow was to be exposed to damaging or harmful chemicals, then the position may be a different as you can certainly anticipate issues like corrosion. Given I have considered the substantive aspects of this watch, I will now endeavour to offer a short analysis of the most basic features. I will start with the clasp, which I am quite impressed with as I have seen several attractive looking designer watches out there but the manufacturers of those watches have devised rather awkward methods in the way the watch is meant to put on and taken off. The clasp-type applied to this watch, however, is fairly standard and simple because it uses a ‘push button deployment’ clasp. Accordingly, it is very unlikely for anybody who might wish to own this watch to experience difficulty putting it on or taking it off. In fact, I am strongly of the view that it is perfectly suitable for a senior citizen or a young male (such as a high school student). It is further notable in general that the clasp is fairly robust and not so easy to unclip. Indeed, it requires a slight bit of pressure to unclip, which is excellent in my view since it offers that additional reassurance that it will never fall off your wrist so easily. Moreover, when it comes to the watch movement, it has a ‘quartz analogue’, which essentially means that the watch movement is driven by battery. Interestingly, in case some of you are unaware, this in fact makes quartz movements incredibly accurate as the amount of time lost or gained over the course of a day is absolutely minimal. With regards to the ‘water-resistancy’ capabilities, the manufacturer’s notes stipulates a standard of 30 metres, which means it is splash proof and waterproof only in very tiny amounts of water. No doubt, having a watch which is water resistant in this sense may be beneficial, but it does not concern or matter to me personally. I say this because I usually remove or hide my jewellery or watches whenever I feel I might come into contact with water or other liquid I do this only to preserve the shine of the item. Nevertheless, the fact that the watch can withstand up to 30 metres is still a bonus. It follows then in the light of the foregoing that this watch is an excellent piece and certainly a worthy buy. In fact, at the price it currently stands at, it is very much worth it. All too often, we commonly say to ourselves that we are only paying the incredibly exorbitant prices for the name or the label that is on the item. But, when it comes this watch, I can safely say that it is not overly priced at all the wonderful design, material and additional features that comes with this watch certainly suggests that we are in fact paying for the quality as well. It should be borne in mind also that this watch comes with a 2 year manufacturers guarantee, which clearly suggests that the manufacturer is confident that you will be satisfied with your purchase. Manufacturers usually only offer a 1 year guarantee on products, but this watch comes with 2 years, so it generally signifies that you are not only receiving your moneys worth but reassurance that nothing is likely to happen to your watch (otherwise the manufacturer could not possibly offer a longer period if they thought something would happen). Details about the guarantee as well as about the watch in general is contained in a very informative and jargon-free booklet that comes with the watch. Accordingly, if you are looking for a designer watch which is stylish, contemporary, unique and all within a luxury Hugo Boss presentational box and for a reasonable price, then I would highly recommend this watch. Generally, I would not be surprised if the watch has already proven popular. If you like the watch but are unsure as to the type of clothing that it may go with, then I would say smart or formal. You might well feel you want to wear it with casual clothing however, it does not afford a luxury feeling if worn with anything other than smart clothing in my view, so it is certainly worth owning only if intended to be worn with this type of clothing. There are plenty of other designer watches on the Watchshop . com site for casual wear. I must admit that in reality it looks a bit different than the image. That vague blue color isn't really there. Its rather silver instead of blue. And the lines on the background aren't that visible either as on the picture. Either way it still an amazing watch, really tight looks, the style still remains. The quality of the materials seems really solid. I hope it can keep up! Excellent ordering service along with efficent delivery service. Product delivery in a fantastic presentation box in excellent condiction. very nice watch, got it as a bday present for my dad and he loved it, will use this site again, nice price and very quick delivery and friendly custome service staff!! Excellent product, extremely fast delivery despite it being sent international. I have been suggesting this website to all my friends! The watch was exactly what I expected if not better. It was just what I was looking for. The face is not too big so doesn't look to bulky.